Your 15.5 cu. ft. Top-Freezer Refrigerator in Stainless Steel features upfront temperature controls that make it simple to regulate both the fresh food and freezer sections. Adjustable spill-proof glass shelves provide flexibility to meet your storage needs. GE appliances provide up-to-date technology and exceptional quality to simplify the way you live. With a timeless appearance, this family of appliances is ideal for your family. And, coming from one of the most trusted names in America, you know that this entire selection of appliances is as advanced as it is practical. Your GE ENERGY STAR 21.2 cu. ft. Top Freezer Refrigerator in Stainless Steel easily accommodates gallon storage. This Frost Free refrigerator is icemaker ready for the IM4D optional ice maker sold separately. The Deluxe Quiet Design and Never Clean Condenser allow for complete ease of use. Easily reversible door hinges lets you set up your refrigerator for the best use. 28-inch 16 cu. ft. Top Freezer Refrigerator with Improved Design in Stainless Steel Fit all of your fresh and frozen favorites without sacrificing any space with the 28" wide top-freezer refrigerator with 16 cu. ft. capacity. To give you more convenient storage options, the Flexi-Slide bin quickly moves side-to-side. Plus, enjoy quiet cooling with improved design and ice cold temperatures inside the top-freezer refrigerator with freezer temperature controls. You'll always be sure to have plenty of ice on hand with the optional icemaker. And, there's even frameless glass shelves to give your food a little more elbow room for wall-to-wall storage. 28-inch 16 cu. 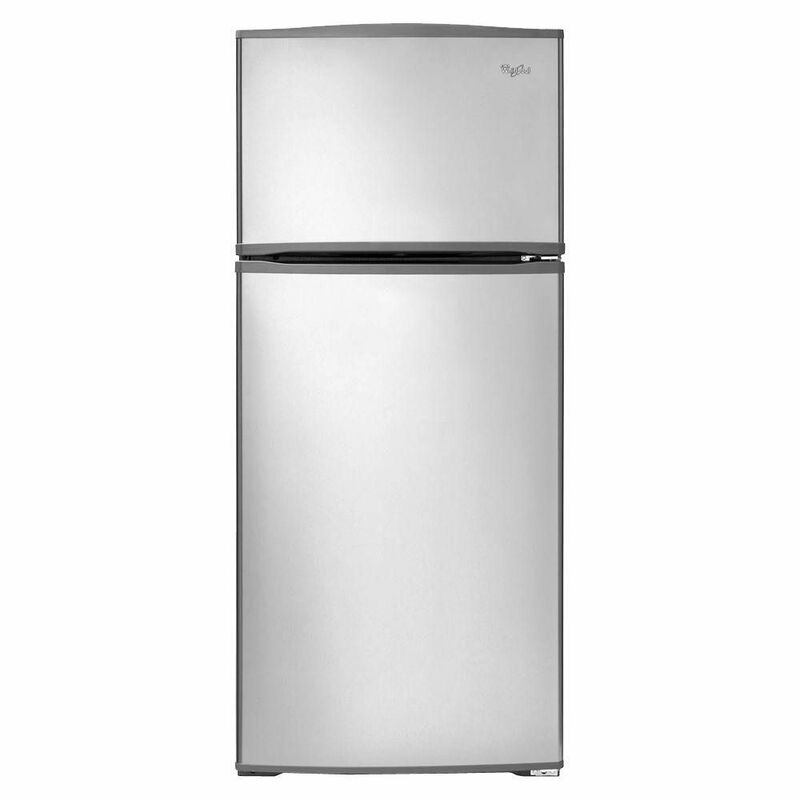 ft. Top Freezer Refrigerator with Improved Design in Stainless Steel is rated 4.5 out of 5 by 158. Rated 4 out of 5 by Andrey from Generally satisfied with the purchase and delivery. I don't hear much noise, which says a lot, co... Generally satisfied with the purchase and delivery. I don't hear much noise, which says a lot, considering I sleep not too far from it with no door separating us. One of the few models that fits into my kitchen. Everything appears functional, although it's only been one day. Complaints: (1) The grey plastic around the door really cheapens the look (see images) (2) Little plastic corner piece is falling off, I'll have to glue it back on (see image). This also looks cheap. (3) There are 2 open niches inside the roof and one niche with some wires inside (thermometer?? ), for which I could not find description of instructions, that also contain Styrofoam. Hoping and praying Styrofoam doesn't get moldy over time.